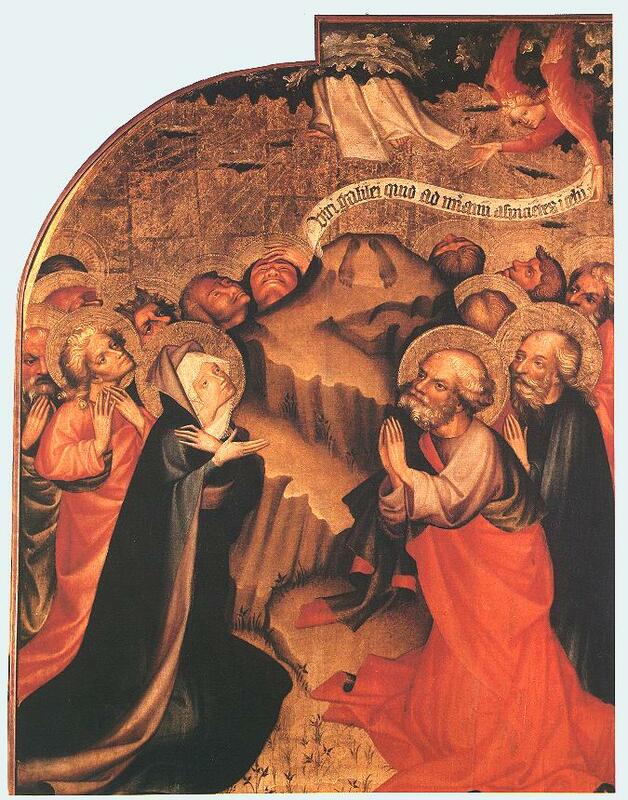 This altarpiece is one of the most significant painting of the period in Hungary; its source can be traced to the court painting in Bohemia, and it is also related to the court painting in Burgundy. In contrast to the external panels of the altarpiece, which all represent scenes taking place out of doors, a rhomboid-patterned golden surface provides the background to the Passion scenes depicted on the internal wings. These panels are chiefly connected with the courtly art of Burgundy and with the entourage of the Duc de Berry. 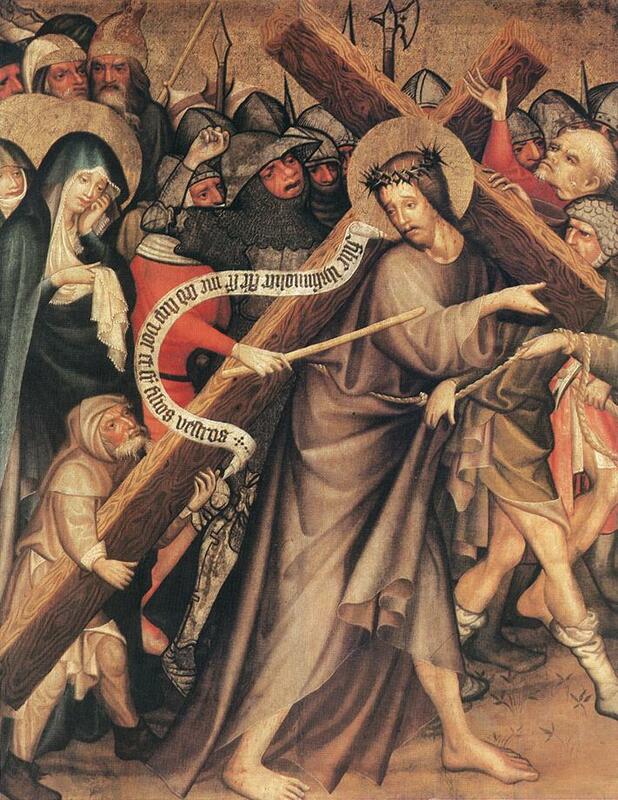 Christ, in front of a crowd of furious soldiers, carries the cross on His shoulder to Golgotha. Virgin and a holy woman follow Him, while the end of the cross is supported by Simon of Cyrene, depicted on a smaller scale. Christ's words are to be read on the inscribed scroll: "Daughters of Jerusalem weep not over me, but weep for yourselves and for our children." The long beam of the cross is placed along the principal diagonal line of the picture and the halo of Christ covers the point of intersection of the beams. The striking veins of the wood give a particular emphasis to the huge cross. Thomas de Coloswar may have been attracted by this task, engrossing him to such an extent that he forgot about connecting the annual rings on the different sides of the cross. Despite the brutal countenances and the coarse gestures of the soldiers the basic tone of the scene is not dramatic. Christ's face is expressing sadness rather than suffering, nor is the Virgin tortured by the agony of the moment; she is rather submerged into more profound sorrow, surprassing the actual event. The process, mentioned in the introduction, can be observed in this picture in the course of its development; a process in which the artist picks out certain motifs from the narrative of events , and transforms and displays them for the purpose of private devotion. 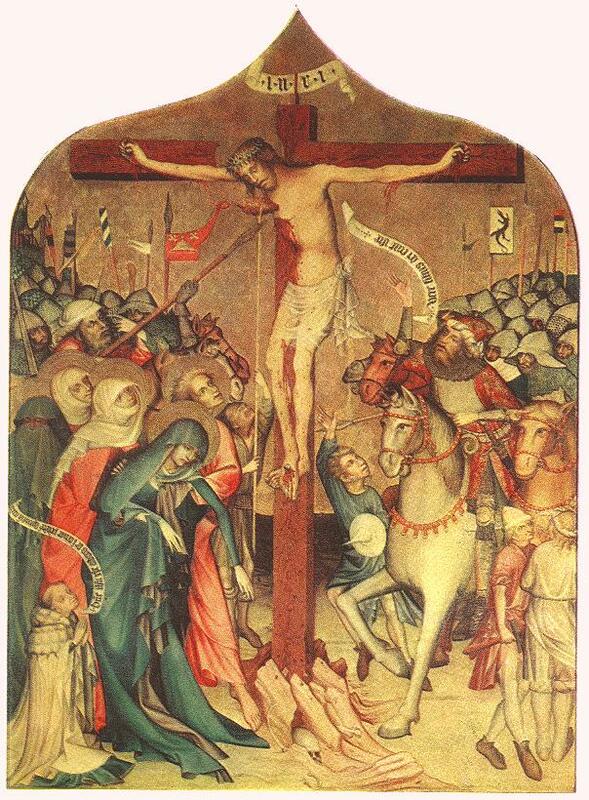 The thick cross seems to push back the soldiers figures and even the figure pulling Christ by a rope round His waist is ousted from the foreground. The giant figure of Christ becomes rigid as if it were a character in a tableau vivant: He stops in His course, addressing the holy women. And yet, this is not a really epic scene either: turning to the spectator He looks into space, and the inscribed scroll, whose semicircular part touches the Virgin s mantle, tells the spectator His words to the women. The scroll separates and, at the same time, points to the figure of Christ, almost putting Him into a frame. By this it makes the hand of the soldier in red, who strikes Him with a stick, symbolic. There is only one single step to leaving out the mercenaries' figures - and the devotional picture is complete for the purpose of private worship. The same tendency is shown by the mode in which the Virgin's figure is depicted. Her face does not reflect the shattering effect of the events which are taking place, but rather presents a state of inward reflection and of meditation.